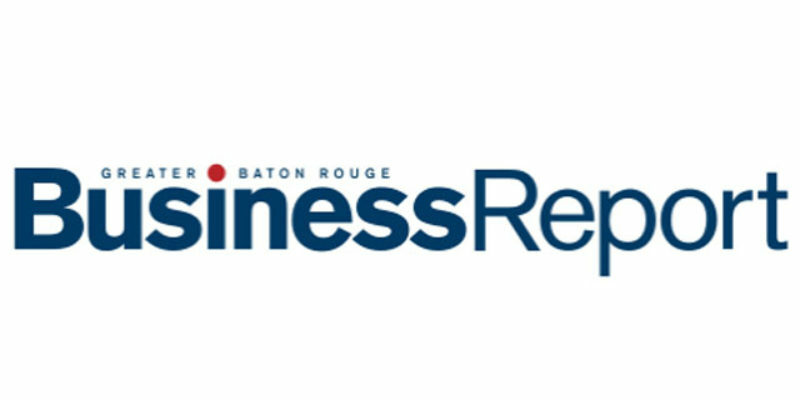 There’s an instructive debate going on at the Baton Rouge Business Report over how to fix what ails North Baton Rouge, the vast swath of crime-ridden, poverty-stricken territory which used to make up the middle class heart of the city. North Baton Rouge’s failure as a community was the single most important issue litigated in last fall’s election which produced one of that area’s state senators, Democrat Sharon Weston Broome, as the city’s new mayor. Broome’s agenda is more or less a redistributive one – she’s looking to move tax dollars generated in well-to-do South Baton Rouge into the northern half of East Baton Rouge Parish to create “economic development” and solve various social problems there. Broome was able to get about 25 percent of the white vote in the parish, which was enough to beat Republican state senator Bodi White in a close vote. So Broome’s first term is going to be spent attempting to “fix” North Baton Rouge. And the question is how that might be done successfully. The Business Report’s editor, Stephanie Riegel – who is no particular hard-core conservative, by the way, and the publication itself had endorsed Broome last fall despite her woeful 32 percent lifetime LABI score, which was a bit peculiar for a business publication to do – wrote a column last week attempting to pin down some of the problems which would need to be addressed – and lamenting the fact they can’t even be raised – if the failure of North Baton Rouge would ever be reversed. But that’s not the entire story, and in these community conversations and dialogues there are all sorts of issues and subjects that are not acceptable to bring up. It’s not OK to discuss the teenage birthrates that condemn so many young people and their offspring to lives of generational poverty. It’s not OK to talk about absentee fathers. It’s not OK to talk about the underlying issues that cause crime to be so high in low-income neighborhoods in the first place. It’s only considered a “conversation” if it falls within the parameter of the popular narrative, which is then perpetuated by traditional and social media. The result is a lot of talk and a lot of self-congratulatory rhetoric from those who brought everyone to the proverbial table, but not a lot of substantive action. How will we accomplish real change if we have to walk on eggshells and dance around subjects that need to be discussed? Riegel didn’t say it, mostly because as she noted she’s not allowed to, but she left the obvious implication that what you have in North Baton Rouge is an entire community where the behavioral standards have slipped beneath the waves, and that individual behavior which produces individual failure will produce societal failure when it is writ large throughout a whole community. She didn’t say it, but we will. North Baton Rouge has a culture problem. That’s not a racist thing to say. When middle-class black people are moving to Ascension and Livingston Parishes at more or less the same rate middle-class white people are, it’s not about race. It’s about culture. They don’t want to bring their kids up in a culture where too many of the people act like losers, don’t obey the law, don’t acquire marketable skills, don’t build careers, don’t pursue a decent education, don’t take care of their property and abuse alcohol and drugs at alarming rates. And so they leave, which means the concentration of the losers gets heavier and heavier and the culture becomes more and more ingrained, and the community fails. That’s an issue which is by no means a black-white thing. Travel up and down in Appalachia and you’ll see lots of communities with a very similar pattern of failure and not all that many black people to blame for it. It just so happens that the people negatively affected by the failure in North Baton Rouge are predominantly black. And it also happens that because so many of those people are black, there is an industry – which appears to be burgeoning in Baton Rouge – full of little entrepreneurs seeking to defend the culture of failure. 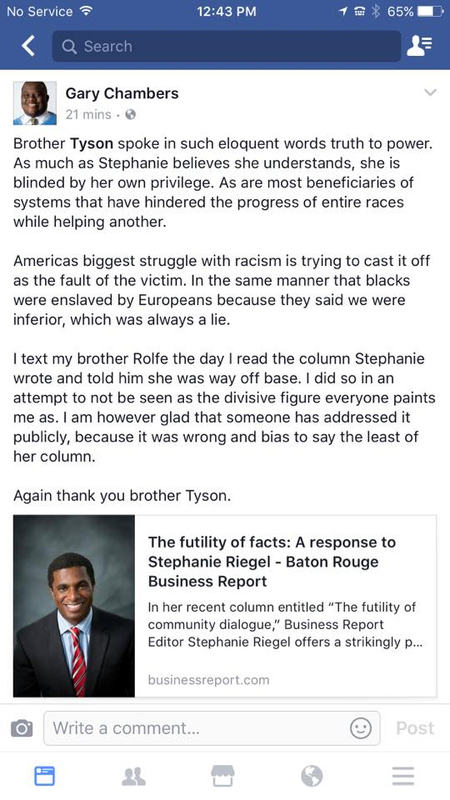 One of the more respectable of those entrepreneurs, LSU law professor and failed candidate for Louisiana Secretary of State Christopher Tyson, wrote a guest column at the Business Report today trashing Riegel as a racist for suggesting that behavior, which we here define as culture, is the driver of bad results in North Baton Rouge. By invoking “teenage birthrates” and “absentee fathers,” Riegel seeks to link back to the long, sordid history of casting black communities in moral or cultural decline as a defense against the struggle for equality, equity and justice. Her point is cunningly simple: If black people would just make better choices, racial disparities would disappear. The “culture of poverty” thesis is both factually and normatively bankrupt. Factually, there is no causal relationship between out-of-wedlock births or absentee fathers and black poverty. Problems with family structure are a result of the chaos and trauma of racialized poverty, not the root cause. They are often the unfortunate, but understandable, response of individuals and families who have endured generations of state-sanctioned and popularly supported social exclusion, political marginalization, economic exploitation and terrorism. Normatively, Riegel’s logic is even more insidious. When black people die under circumstances similar to Sterling’s, many look for the usual scapegoats to justify their resignation and indifference. “Where are the fathers?” they ask. “I wish he didn’t have a criminal record,” they lament. But past transgressions or family structure should not impair black folks’ ability to access fair and impartial justice. Black worthiness of Constitutional protections such as due process must never be conditioned on how others view black folks’ life choices. To assert otherwise is to suggest that black people occupy a conditional citizenship or, even worse, a conditional humanity. If we want to have a frank discussion about the roots of black poverty, we should start with demonstrable evidence as opposed to recycled stereotypes. There is ample data chronicling the relationship between Jim Crow and black poverty. There is a growing amount of data on how redlining and federal housing policies subsidized generations of white wealth creation while simultaneously creating black ghettos. Because of historic wage theft and employment discrimination, black men and women still earn a fraction of their white counterparts. Moreover, decades of over-policing, over-charging, over-sentencing and over-incarceration have separated far too many fathers and mothers from their families. Economists have long tracked how cumulative racial disadvantage is inter-generationally transferred. In fact, the think tank Demos recently released a study on the racial wealth gap entitled “The Asset Value of Whiteness.” Their statistical analysis illustrates that structural factors—not individual choices—drive ever-widening racial wealth disparities. A 2013 Centers for Disease Control study found that black fathers are more involved in the lives of their children than their white counterparts. I could go on. There are simply reams of data debunking Riegel’s tortured misconceptions. This is not some “popular narrative” as Riegel dismissively suggests. Its American history 101. That is why most of us who grew up with our fathers and married before having children see ourselves in Alton, Trayvon, Tamir, and Sandra. Yet after repeatedly telling our stories and citing the mountains of easily accessible data verifying the permanence of institutional racism, we too often hear the same tired “culture of poverty” distortions. “And it is in those times that, like Riegel, we also wonder if further discussion is futile,” is how Tyson, who was the Transition Coordinator for Broome’s transition team, closes his column. Funny thing about that “over-policing” business. A couple of weeks ago, Tyson’s pals at Together Baton Rouge put out a “study” suggesting that the Baton Rouge Police Department was racist in its arrest policies where drug crime was concerned because, it alleges, drug use in mostly-white South Baton Rouge is no less prevalent than in mostly-black North Baton Rouge and yet the vast majority of the arrests for possession and distribution of narcotics take place in North Baton Rouge. BRPD’s response to this was as simple as it could be – they get a lot more calls from citizens complaining about dope dealers and crackheads on the streets in North Baton Rouge than in South Baton Rouge, and in response to those calls they make arrests. Meaning that it’s people in North Baton Rouge who haven’t bought in to the “culture of poverty” that Tyson decries the description of who are begging for law enforcement’s protection against those immersed in it. And because law enforcement simply can’t do enough to keep those neighborhoods safe when so many of the residents are participating in those bad behaviors, the people making the calls eventually give up and move someplace else. Which brings up another case – that of the alleged failure of BRPD officers to timely arrive on the scene of a shooting which left a man dead in Scotlandville last week, something the department is internally investigating. It seems a trio of villains were driving around in that area and doing drive-by shootings of people unfortunate enough to be outside on the night of Feb. 14, and one of the victims bled out near the street while the police, who were alerted by the system of microphones placed around the area to detect gunshots (! ), never happened upon him. In other words, the complaint being “under-policing” rather than “over-policing.” One wonders whether Professor Tyson has a problem with the neglect of shooting victims, or if he thinks it’s part of a solution. Blaming racism for the fact there are apparently black people in North Baton Rouge who call it a fun night out to shoot black people in the street is not a solution to the social problems in North Baton Rouge. Sorry, but it isn’t. Tyson can complain all he wants about the racism of Stephanie Riegel, but all he’s doing is making her points for her. And if he thinks the people Broome will task with paying for the coming renaissance in North Baton Rouge are going to accept a bunch of lecturing about The Asset Value of Whiteness in lieu of real efforts to end social pathology and create success with resources forcibly extracted from them, he needs to think again. The economic development folks and real estate people in Ascension and Livingston Parishes are covered in drool as they read his column. As for Riegel, she now knows the reward for trying to inject common sense into this discussion. This isn’t about solving problems. It’s about getting paid in taxpayer money. Demanding solutions be driven with that money makes you a problem for Tyson and his compadres, and for doing so you must be covered with a white sheet.